Now today is a special day. It's a green. I like it. AND it likes me. Wahooooo! As you know, me and green polishes .... nah. It's never happy. 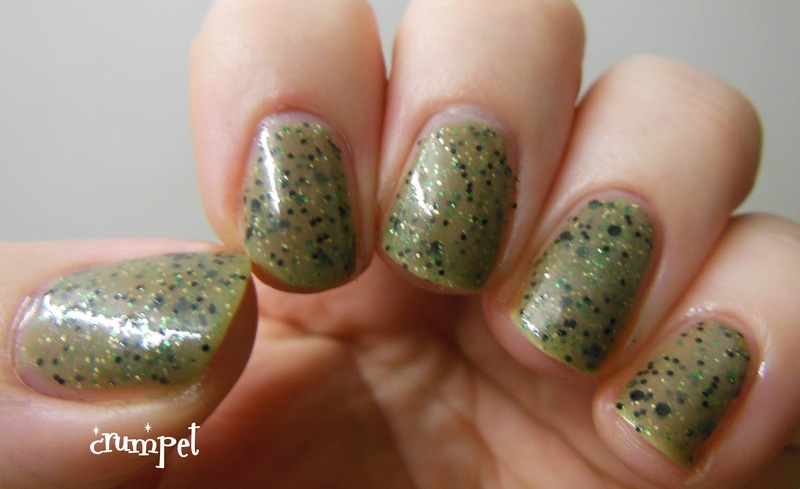 For this reason, I always resisted Dollish Polish's Zombie Flesh, beautiful though it is .... until I saw it a few months ago on Chloe's Nails and yes, my first green lemming was born! So why did this one squeeze through my defenses? Well, the complexity. There's a LOT going on, and I love it for that - but not so much that any one component overpowers the rest. Then it's loaded with tiny black glitter. Pustules? Scabs ? Hair follicles ? Who knows, I'm not good with zombie folklore. Then we have microscopic electric green-yellow glitter. Subtle dazzle. Great juxtaposition with the black, and the dead tone of the green. Usually at the end of a green glitter polish post I end it feeling "appreciative" of the art that went into it, but slightly sick, cos, you know, it's GREEN. But not with this one. I genuinely like this, so it's going to live in my very small "green box" with a very few select friends!